Since opening their first store in Derby nearly six years ago, it has always been Love Aroma’s focus to help more customers discover home fragrance; so they went and did something super awesome and created the new Love Aroma app. So now you can discover home fragrance in your pocket! Although the Lover Aroma website has always been mobile friendly, our friends at Love Aroma wanted to give their iPhone customers the best possible experience, and to do that, they needed an app. Hunting out the latest home fragrance trends is now just a click away. The Love Aroma app is designed to be as simple as possible, but includes some really useful features, such as Wish Lists (Sarah’s and mine are each easily a mile long!) and Scanning. The scanning feature allows you to scan the barcode of your favourite home fragrance products to find the correct product quicker than ever. Perhaps you’ve just finished your latest Yankee Candle, and want to find the exact size and fragrance again. Just flip the candle over (when it’s not lit of course), and scan the barcode with your iPhone’s camera. So now, when it comes to discovering home fragrance – you can say there’s an app for that! 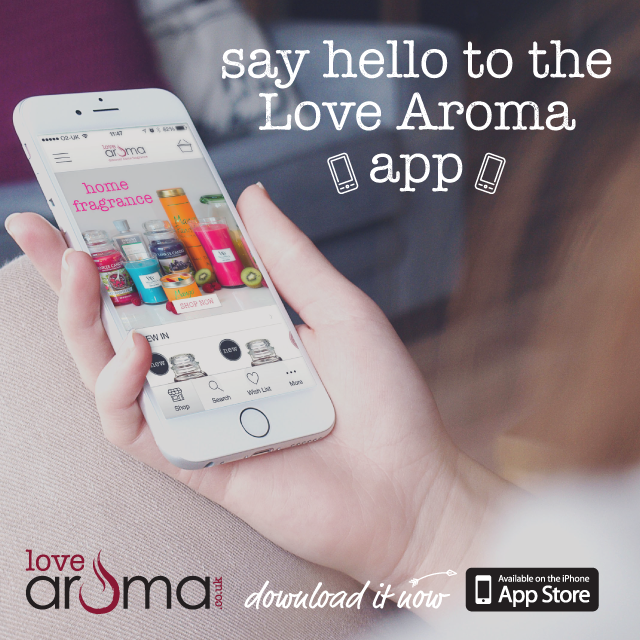 The Love Aroma app is available now in Apple’s App Store. It is currently only available for iPhone’s running iOS 6.1 or above.